Foreign Languages for Kids by Kids is a Spanish program that uses video instruction and workbooks to teach students using an immersion approach. 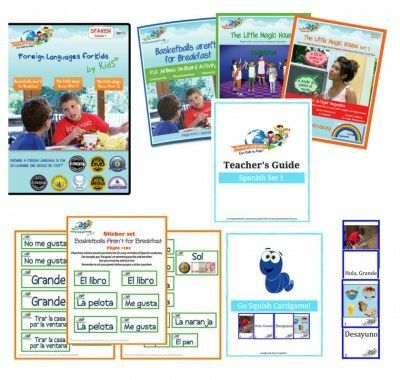 The Starter Set 1 includes a teacher/ parent guide, workbook, DVD, stickers, and flashcards for three different levels. The set also includes the Go Squish Card Game. The Spanish program is complete immersion therefore we did not hear any English words when we watched the video for the specific level. The immersion aspect allows students to get used to hearing words only in Spanish and inferring the meaning of the words. The workbooks that accompany video are also written primarily in Spanish including the directions. Immersion of the written language supports building reading skills in Spanish including pronunciation and comprehension. Although the program is complete immersion, there are enough visual clues for students to decipher the meaning of the words. The understanding of the words may not be apparent during the first viewing of a lesson, but each video is watched several times before moving on to the next level. The parent/ teacher guide serves as a guide to using the program. The guide provides instruction into how the videos should watched. Although this is a video based program, videos are not expected to be watched in their entirety during the first few lessons instead the guide instructs parent to stop the video at a specific minute with each day receiving more viewing time until the entire video has been viewed. Each video focuses on specific words to be learned; these words are included in a table in the parent’s guide for the level. The table is written with the Spanish words along with the English translation so while the child may not know the meaning of the word, mom or dad isn’t left out of the loop. Foreign Language for Kids by Kids include lessons for all learning styles. There are stickers included to allow for children to move around and label items around the house in Spanish. There are flashcards to help review the words that have been learned from the video. The flashcards are actual images from the video so this helps to put the video into the child’s hand. She is able to recall what the scene represented during the video. There are also several games included within each level. Each level only has one video, but the information from the video is used over a course of 11 lessons for level one, 18 lessons for level two, and 20 lessons for level three. Each level has a certificate of completion to be given to the student. How we are using Foreign Language for Kids by Kids? We use the program a few times a week. The girls and I watch the videos together. After we watch the video, I follow the plans for the day as it is written in the guide. I decided with this program I would use it as written outside of creating a poster for the to put the stickers on. I am not a fan of having stickers on furniture so instead I printing out pictures for them to label. The daily lessons are no longer than 20 to 30 minutes, and Spanish has been deemed a fun part of our day. Each lesson has variation of some of the key components of the program for instance as the lessons for each video progress there are some days when watching the full video isn’t instructed instead on these days the girls are expected to play games or do lessons out of the workbooks. The workbooks are consumable and are expected to be used by one student. Since we started the program as something fun to do this summer, I did not have them complete the workbook lessons instead we used the activities within the workbook as review. The girls think the videos are funny. They draw them into the story line by doing things that are attention grabbing, and because of this the immersion works. My daughters were able to define the words simply by watching the video without any leading from me. I was really impressed, and they did not become frustrated since the videos do not include English. To be honest I thought it would take them longer to figure out phrases like ahi esta and aqui esta, but by the time we watched the video in its entirety the knew what the phrases meant. I look forward to continue working through the levels with the girls.